I have always loved stationery. A lovely monogrammed note card, the perfect vintage Valentine, my mother's favorite folded cards with real fabric to make dresses. Stationery is an elegant way to tell someone you were thinking of them, and reveals so much about your personal style and the tone of your wedding. I personally love letterpress. The ink, deep in a bed of thick, creamy paper is so luscious it's almost obscene. One of my favorites is Bella Figura which creates the most delicious paper products a girl could dream of. Use the gallery of invitations and customize to your heart's content, or work with them on a design that's utterly your own. They're located outside of Syracuse, NY and they're wind-powered, carbon-neutral and eco-loving. 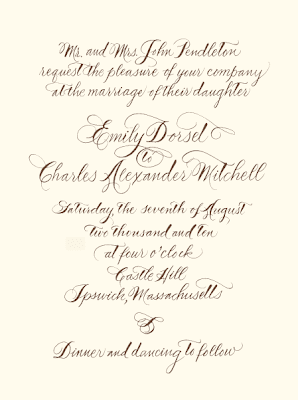 They print exclusively on cotton paper, so there's no guilt in gorgeous invites. Letterpress is a little pricey, but heavens, it makes my heart race!